the number of branded coffeeshops like Starbucks have trebled in recent years even though their drinks are usually double the price. Also the continued increase in JD Wetherspoon pubs which offer a decent breakfast for £3 has not helped the small cafe trade. Whilst I have partaken in many a Wetherspoon breakfast myself I do still prefer to check out the smaller cafes and the local characters who eat in them ( the latest for my fave breakfast is the Regency Cafe near Victoria). Some of the pictures below are a few years old by now though some recent ones have been mixed in here as well. As always I shall continue to add new pictures over the next few weeks/months/years. 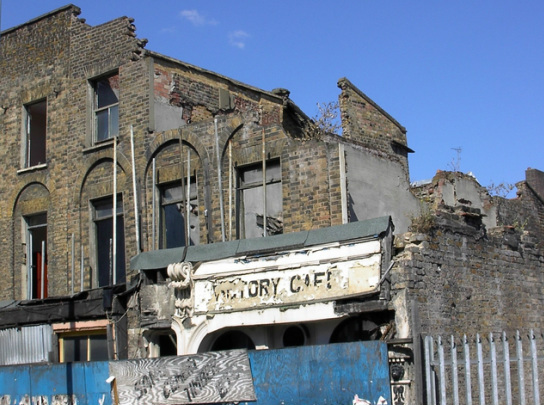 This sad site is the the Victory Cafe in Hackney Rd that I snapped back in 2003 just as the block was being demolished. The site is now the RE Hotel. Their web site calls the area Shoreditch but I'm sure thats really Bethnal Green!! 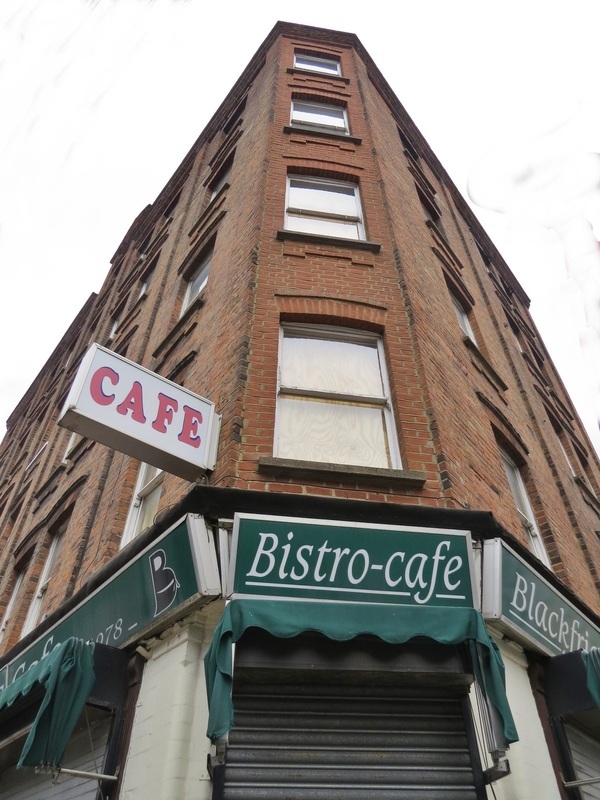 The fate of block first came to my attention when the Blackfriars Cafe, that I occasionally used to call in for breakfast, was closed down in Summer 2013. The popular family run (since 1978) Blackfriars Cafe was the only proper fry-up in the area. Some London cafes have closed in London due to declining business but this one was ever popular and was forced to close due to the forthcoming demolition of the Edwardian mansion block that it was sited in. The block also contained a newsagent and a dry-cleaners. A bar called Imbibe in a building adjoining St George's Mansions also had to close to make way for the new development. The bar, previously a pub called the Old King's Head dates to 1839. Russ Conway the pianist was known to have played at the pub (Conway had 20 piano instrumentals in the UK Singles Chart between 1957 and 1963, including two number one hits). Behind the above buildings are some old garages. The whole lot is to be demolished and replaced by a 10 storey apartment block called Blackfriars Road Central. There will be some ground floor retail outlets and according to the developer's website "the existing Blackfriars Café and laundrette will be provided space within the new development." Despite local opposition, Southwark Council's planning committee voted four to three in favour of the scheme, with Labour members backing the application and Lib Dems voting against. An 82 year old woman died and another woman was injured after a fire at an old Deptford cafe in the early hours of the morning in May 2013. The victim was an Italian woman who ran the family-owned Lou's Cafe for decades before it closed several years ago and used as residential accomodation. An accelerant was used to start this fire & a man has been charged murder & counts of arson with intent to endanger life. Closed a few years ago, fenced off and surrounded by construction work for the Blackfriars Station redevelopment. Now the Station is complete the cafe site is now accessible though this dusty slightly forlorn place looks out of place next to the modern new Blackfriars Station. Only a matter of time before it becomes something else due to its prime position. Maybe another cafe but more than likely a chain. Star*ucks anyone? Susan Heaver writes: "When driving through Blackfriars with my mother recently she let out a sudden gasp. She had spotted a derelict snackbar/cafe by the bridge called, Bon Appetit. My mother will be 85 this year, my father died in 2012. They visited this cafe after going to the cinema on their first date in the early 1950's. They had a coffee then he walked her to the underground station to catch her train home. 10 days later he proposed to her. They were very happily married for 58 years. I do not know if the cafe was called Bon Appetit when they went there but I wondered if you would have any idea where I might look for a photo of it back in the day". Allegedly serving up the best fry-ups and home-made steak and kidney pies for miles around, and run by Brian (not George), the clientele here was a great mixture of builders, lorry drivers and Canary Wharf suits. Other attractions included showers for the drivers, cracked plastic chairs, and copies of the Sun and Truckers Weekly. Georges Diner – they never got round to putting an apostrophe in the sign – closed down in 2005 to make way for the new Silvertown Quays development (still pending). Tony Jauncey writes to Derelict London: "From 1970 to 1973 I work as a sub contractor with my Dads firm in Crosse and Blackwalls in Silvertown. The food in the canteen was not too bad but we always chose George's out of preference. The first time I went into Georges I was amazed that the family that run it were so small, the average height of men and women was about 5ft 2. Brian was Georges son and as you say, the food was superb. I can honestly say that I have never had a better breakfast since, the place should have been listed. Sadly the guts have been ripped out of the East End, but your site brings back many happy memories"
Mark Johnson writes to Derelict London: " I remember the Sandwich House in Greenwich always seemed to be open: me and my fellow university students used to go there after a night out - only place in london I reckon you could get a gingerbread man at 11 in the evening!"